This title just sounds like a fairy tale doesn’t it? Are there really people out there that can get through college without owing any money to anyone? With college costs soaring to over $30,000 a year, this just seems impossible! But, let me reassure you, it is not impossible. Apply the following tips below and you may soon find yourself with your college degree and absolutely no debt! This sounds a little trite, but you do have quite a lot of control over how well you do on your ACTs! You see, this test is fairly standardized and is quite similar every year. If you begin studying for this test as a freshman in high school, then you would probably score pretty well once you took it officially as a junior or senior, right? Well, what if you went to some classes that would teach you how the test was structured and what you should look for to make your selections easier? I had some friends that had prepared for this test years before they actually took it, and guess what? They did amazingly well. One of them scored in the upper 95th percentile, while the other scored in the upper 99th percentile (and nearly aced the test). Both of these individuals received very large scholarships and had to pay next to no college expenses. It pays to study extensively for the ACT and SAT. Today, parents are beginning to save for their children’s college education long before their kids are even talking. This is an excellent idea! By putting away a small amount each month and letting the interest compound on itself, one could easily save $50,000 or more over the course of 18 years. To do this, either look into 529 funds or put money toward a specific institution where your child will be going to college. We touched on this briefly in the first tip, but not all scholarships are earned by getting an amazing ACT score. Many are earned through essays and personal interviews, and there are quite a few out there for you to apply to. In fact, many scholarships ask for similar information so if you develop a system, each one should only take a few minutes to fill out and submit. Fill out enough of them, and you might soon find yourself paying nothing for your entire college education. This tip often gets overlooked, but it is a biggie. If you decide that you would like to live on campus, then you had better have about $40,000 extra dollars lying around your bedroom somewhere. Factoring in the expensive on-campus housing costs and food, you can easily dish out $10,000 per year for simply having a place of you own. If you want to get through college without any debt, then it simply isn’t worth the expense. Live at home, eat your parents’ food, and buy a fuel efficient car for commuting. This is where the rubber meets the road. In order to truly earn enough to get yourself through college without owing a cent, then you must commit to working while school is in session (typically 30 hours a week or so) and also during the summer time (at least 50 hours per week). Even on a meager hourly wage, one can still earn $15,000-$20,000 a year by putting in the hours. 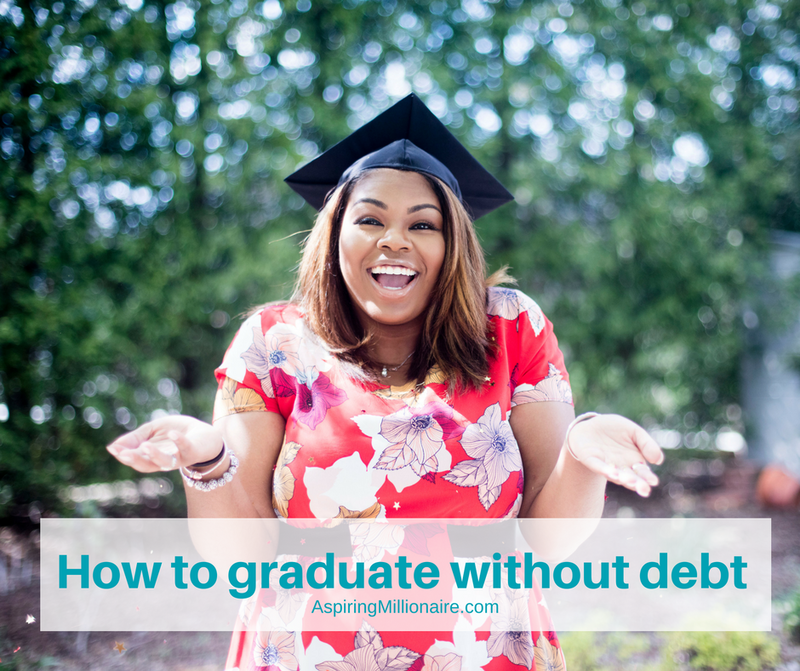 Are you going to graduate from college without any debt? How did you manage it?